R.E.A.D. 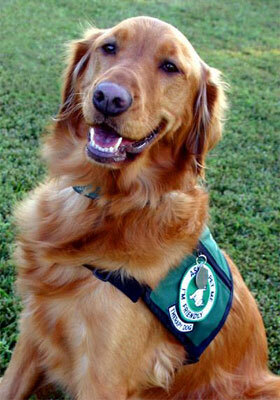 dogs, such as Molly, are registered therapy dogs who are working to improve literacy skills. Along with their handlers they have been providing much assistance to those youngsters demonstrating reading lags and associated problems related to poor self-efficacy. Unconditional acceptance from a dog allows children to forget about their reading difficulties. Instead, they are now viewing reading as a fun and much-anticipated event. I rescued my sweet Golden Retriever Molly in the fall of 2004 shortly after Hurricane Ivan. A neighbor owned her and was using her as a breeder for his back yard puppy mill. She lived in the dirt, dug a hole in the middle of the summer to have her puppies, and had never been to the Vet. She had no collar or license, and kept digging out of their yard and coming to my house. I had been wanting to get her out of that situation, and the neighbor finally agreed to sell her to me for $350. Molly is a sweetheart. She is now spayed, de-fleaed, de-wormed, treated for heartworms, immunized, and licensed. Molly adjusted amazingly quickly. I had her and the cat separated for a couple of weeks. Neither had been around the other species before, and Molly wanted to chase Wesley. He would run, puff, and hiss. I went through a devastating hurricane that September. It did over $40,000 worth of damage to my home. After two years I am still dealing with contractors, shoddy workmanship, and major disruption on a daily basis. What a time it was to adopt my very first dog! Just two months after Ivan hit. No fence, workers traipsing through the house constantly, and the noise of roofing and tree removal and carpenters day after day. But I had to get Molly out of that horrid situation. We enrolled in a wonderful obedience class with a very patient instructor. Molly took to it like a duck to water. I could see right from the beginning that with Molly's sweet personality and love for children, she would make an excellent Therapy Dog. At the class I met a woman who was active with the Delta Society and she put me in contact with our local chapter. After Molly finished basic obedience and earned her Canine Good Citizen, we signed up for the next Delta Therapy Dog Class. This was a wonderful experience for both of us. The class met every Saturday at a local nursing home for six weeks. It was then followed by a comprehensive practical evaluation at a location new to both Molly and me. I was pretty nervous, but Molly did fine and was then qualified as a Delta Registered Pet Partner. For us to become a R.E.A.D. Team, we took an additional class that met for a whole day at a library several towns away. We got very lost, but I finally found the place and it was well worth the effort. After completing that training we were then able to go into libraries and schools as a R.E.A.D. Team. Right now Molly and I visit a local nursing home on Thursday afternoons and go to the library one Saturday a month. In the fall we will resume our R.E.A.D. sessions at a local Elementary School. Kiwanis Club of Big Lagoon has found another way to improve reading proficiency among children in western Escambia County. It recently presented a check to the Reading Education Assistance Dog program, also known as READ. The club decided to make the donation after learning about the program from fellow Big Lagoon Kiwanian Nora Wilcox. 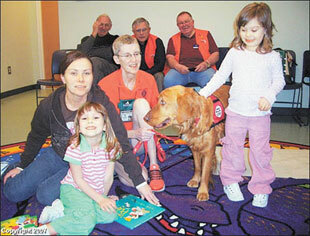 The retired Navy flight surgeon and her golden retriever Molly participate in the program. READ allows children who are intimidated by reading aloud in a group to read to a dog to help them improve their reading skills. Wilcox said she became interested in the program and the Delta Society, a national organization whose mission is to improve human health through service and therapy animals, when her father was in a nursing home. The highlight of his week was when members of the Delta Society would bring their cats and dogs to visit the residents of the nursing home. "This gave my father such pleasure in his final months when he couldn't do much and had very little enjoyment in life," she said. She decided then that she would like to do pet therapy after her retirement from the Navy. She and Molly went through extensive training and a strict practical evaluation to become registered Pet Partners. "After that, we took additional classes to also become certified as a Reading Education Assistance Dog Team," Wilcox said. "This certifies us to go to schools and libraries and do literacy volunteer work with children." During a recent READ program at the Southwest Branch Library, Big Lagoon Kiwanians Dave Herman, Carmen Ciardello, Al Bender and Curtis Brotherton watched as Molly and Great Dane Cosmost listened to children reading. At the close of the reading hour, Kiwanis Club of Big Lagoon president Carmen Ciardello presented a $500 check to Wilcox to be used in furthering the reading program. This article contains copyrighted material, the use of which has not always been specifically authorized by the copyright owner. I am making such material available in my efforts to provide background knowledge on areas related to canine cancer. I believe this constitutes a 'fair use' of any such copyrighted material as provided for in section 107 of the US Copyright Law. In accordance with Title 17 U.S.C. Section 107, the material in this article is distributed without profit for educational purposes.